You get your FREE custom map for your location. This is very easy. Just click on GET MY MAP and enter your address (we do not capture any information). See example to the left. 2. Look up today’s good walk sectors. Each day’s good walk sectors are found right on the site next to the calendar on the home page. You can click on TODAYS INFO to go there. Each day when you leave your house for the first time, walk for 15 minutes in the good sector (longer is better). Don’t walk in the bad sector. Want to get more deeply into the “why’s and hows” ? Scroll down to see more! Want more complete explanation? Keep reading. The map you will receive is similar to the one pictured above. Your home address will be in the center. 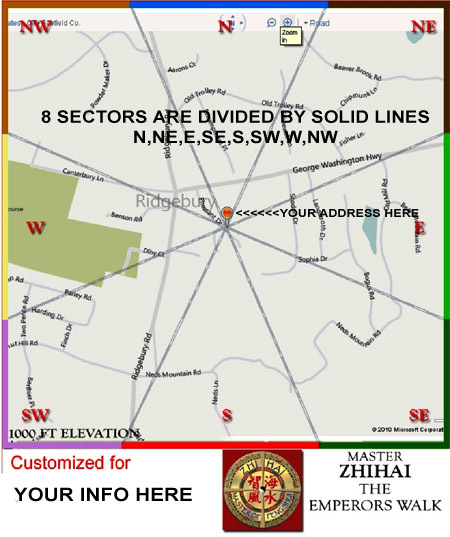 Notice there are 8 sectors which indicate compass directions out from your home. Each sector represents an area that you might walk within based on “today’s info”. You may also want to create more custom maps with your work address because the walks work for any place that you spend several hours indoors. When you get that feeling you need to get out of the house or work to take a walk it means that your energy is being used up. Any time like this is a good time to do the walk in the right direction. I do provide a late afternoon/early evening series of walks along with the morning walks. You will receive new information for each day in “TODAY’S INFO” section of this site’s home page (menu item). Be sure to click “more info” to see the day’s chart! You can also click on the CALENDAR (middle of home page) to see a walk for any other particular day-if it is highlighted with a box around the date. Below is an example of the walks that are posted every day: Note any of the blue sectors are good but the first is always the best. NOTE: the first sector mentioned has the most power. If it is very powerful it will also be indicated with two plus signs (++). The second a bit less than the first and the third even less… but is still good. Just look at the plus signs. Easy! You can also do this when you leave work. A word about the RED “Dead Doors”. DO NOT walk in these sectors first thing. If you ever had a “bad day” where everything was going wrong chances are you walked in a “Dead Door” sector first thing that day without realizing it. 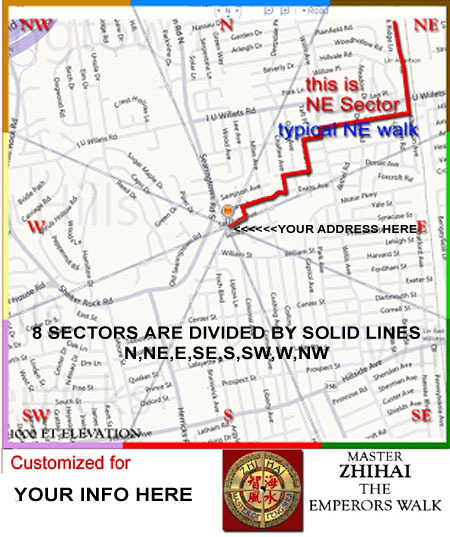 The map below shows how you would walk in a NE direction. The home page says walk NE on August 12, 2011 between 6-8AM. It’s easy. Just walk in the NE sector after you leave your house. Enjoy it. HAVE FUN. EXPLORE. FIND INTERESTING PATHS AND NEW STREETS. It does not need to be hard. Following the walks each day is very easy, healthy and fun. My clients are amazed at the results. Jobs where there were none before. Weight loss, found relationships. It works and you have nothing to loose by going for it. 1. When you leave your house first time in the morning walk in the “Good Walk” directions. 2. Do not enter the RED “DD” (dead door) directions when you FIRST GO OUT. 3. Walk casually for 15 to 30 minutes…or more if you like. 4. After the initial walk you can go anywhere you want… in any direction. WITHIN ONE WEEK YOU WILL FEEL THE DIFFERENCE. Many of my clients had immediate positive results.